Dash of Green: Birthday Weekend! 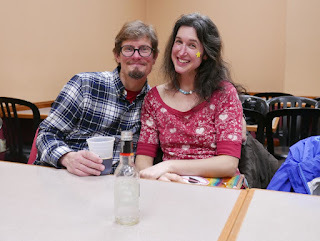 We had not one but three birthday parties to go to. On Saturday alone, there were two birthday celebrations. For the first one, William was invited to celebrate the 4th birthday of his good friend Annika at the amazing Peak Elite gymnastics arena! 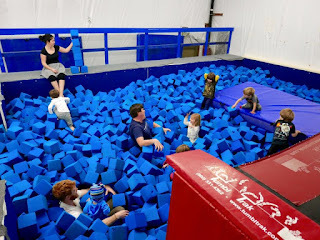 What was great that not only could the little ones go hog wild jumping/rolling/climbing/etc but we adults had equal access to the uneven bars, balance beams, and best of all...foam pit!! 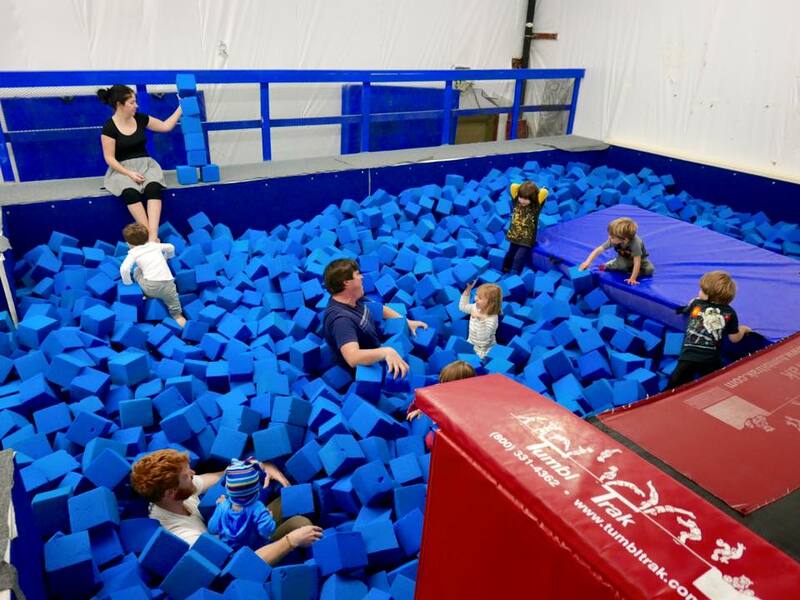 Must've been upwards of eight feet deep, and those foam blocks had a clingy quality to them that would make it feel like they were dragging you down. Moving through it was like "trying to run in a dream." Same level of frustration. But a hoot nonetheless. Gotta say, one of the main things I took away from that party was how embarrassingly out of shape I am. I tend to assume that because I bike and walk a lot that I'm okay in the fitness/strength department. It made me realize how rarely I move my body dynamically with even the simple action of jumping only coming along once in a blue moon. It got me thinking that I'd like to a) work on some strength training at home (pushups/crunches/etc) and b) hold my birthday party celebration at the roller rink at Eugene! Assuming I even hold a party... That's also a rarity ;) It's just rare for us adults to move around a lot in the party setting -- mostly it's conversation and eating (which I love!) but yeah, it's been a long time since physical activities been included. The second party of the day was to celebrate Annika's incredible mama, Jamie! Hit up a Mexican restaurant we haven't been to since I was pregnant with William (yowza) where I had not one but two margaritas. Oops~! Then at Woodstock's Pizza, the adults-only party was a blast! Dash and I got to talk with a wonderful couple named Andrew and Brooks, and I must say it was the best time I'd had in adult company in a looooong time. Then today Ella had another birthday party to go to after church! Oh! Speaking of Ella, this is super off-topic, but I want to share a recent little art piece she made. And while I am uploading photos, here is one from last week when the family was back in our neck of the woods. Aren't they a beautiful family, the three Eidler-Perez's~? I love love LOVE them!!!! Hope you had a good weekend too and you are looking forward to a new week. Until next time, take care and Happy Birthday Weekend! !